KANSAS CITY, Mo. - Feb. 28, 2017 - PRLog -- In just 6 weeks OYO Fitness received over $659,000 in pre-orders from 4,200 backers, making the DoubleFlex Black gym the second most funded exercise product ever on the Kickstarter crowdfunding site. The DoubleFlex Black gym raised more funds than 99.89 percent of all products ever offered on Kickstarter. "Our OYO team believed we had developed a ground-breaking fitness product and worked very hard to create the best Kickstarter campaign possible, however we were just blown away with the response from the marketplace," said Paul Francis, founder, inventor and CEO. 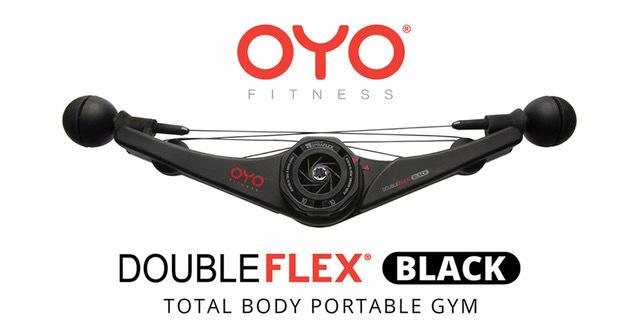 "U.S. and international distributors are now working with OYO to get the DoubleFlex gym into everyone's hands." The DoubleFlex Black is a total portable body gym that only weighs 2 lbs., yet produces up to 25 lbs. of smooth resistance that feels like free-weights, however the resistance is created by patented SpiraFlex technology used to keep NASA astronauts in shape in space. The DoubleFlex is the only exercise device that applies resistance to both sides of muscle groups in one motion, building a balanced body in half the time. Combining strength with movement, without weight or momentum, this portable gym is the new way to get fit anywhere, anytime. The DoubleFlex Black is the second generation of the original DoubleFlex, featuring more resistance, additional cable extension, and also folds up to fit in a back pocket or carry bag. The SpiraFlex technology was developed when Houston discovered they did indeed have a problem. "NASA was trying to find a countermeasure to keep their astronauts from losing bone and muscle mass in zero gravity," Francis explained. "A NASA study showed my SpiraFlex technology increased lean muscle as much as free-weights, so my team was selected to develop the first 'Mission Critical' strength training equipment to keep astronauts fit and build muscle in zero gravity on the International Space Station." "Floating in space is similar to leading a sedentary lifestyle on earth. The body begins to atrophy unless resistance training is a 2 to 3 times a week habit," says Nick Bolton, the Director of Fitness at OYO. Francis is no stranger to the fitness industry, as he has partnered in the past with some of the top fitness brands, and has also licensed SpiraFlex to Nautilus, Inc. to power what many people consider the best home gym yet, the Bowflex® Revolution®. The DoubleFlex Black is now available for pre-order at Indiegogo here. The closed Kickstarter campaign can be seen here. ABOUT OYO FITNESS: OYO Fitness creates innovative fitness solutions to enable you to get fit OYO (On Your Own) — helping you meet and beat life's challenges. OYO integrates SpiraFlex technology into fitness products that are lightweight, compact, and provide the same benefits as training with free weights. Studies show that resistance training not only builds bone density, lean muscle, and burns fat — you will also feel better, look younger, and live longer!